FlG. 3. Reduction of riboflavin-binding apoprotein (apro-RBP) by COO'- radicals. 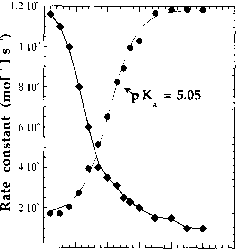 Shown is the variation in the rate constant of reaction (1) (Scheme 2) (♦) (left scale), and of the average extinction coefficient of disulfide radical (•) (right scale), with pH. Points represent experimental data. For extinction coefficients, the line is the best fit to experimental points, using Eq. (13) (see text), which givesapATaof5.05. [apo-RBP], 100 ¡xM\ [Hc00~],0.1 M\ phosphate, 10mAi; N20 atmosphere; dose, -25 Gy. Scheme 2] do not vary much with the protein, but increase strongly with decreasing pH (Fig. 3). Conversely, the free radical decay varies with the protein, reflecting the relative importance of reactions (5) to (8) (Scheme 2). Also, the final compounds may be different. The free radical decay becomes much faster in acidic medium: the lifetime of the protonated disulfide radical is ~20-100 ¿¿sec, because of the weakness of the protonated disulfide bond22 and because of the catalysis of reaction (3) by protons. 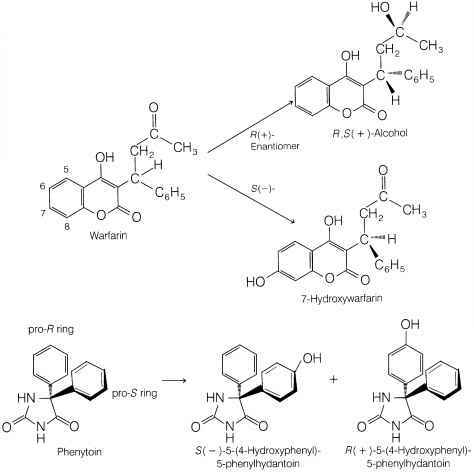 The opening of the radical, which is the main reaction [see reactions (3) and/or (4) of Scheme 2], is first order. 22 J. Berges, F. Fuster, J.-P. Jacquot, B. Silv, and C. Houee-Levin, Nukleonika 45, 23 (2000).